To commemorate College Readiness Month, the Wilt Chamberlain Memorial Fund (WCMF) proudly teamed up with the School District of Philadelphia, the Philadelphia Mayor’s Office of Education, and local college preparatory programs to welcome more than 75 Philly students and their family members to a college preparation workshop. Students received help and support on completing their Free Application for Federal Student Aid (FAFSA), a very important step on a student’s journey through the college access process. Students and family members received some inspiring words of encouragement as well as a call to action from both Dr. William Hite, Superintendent of the School District and Otis Hackney, Chief Education Officer for the Mayor’s Office of Education – asking students to complete the FAFSA so they could receive much needed funds that would help pay for their college tuition. 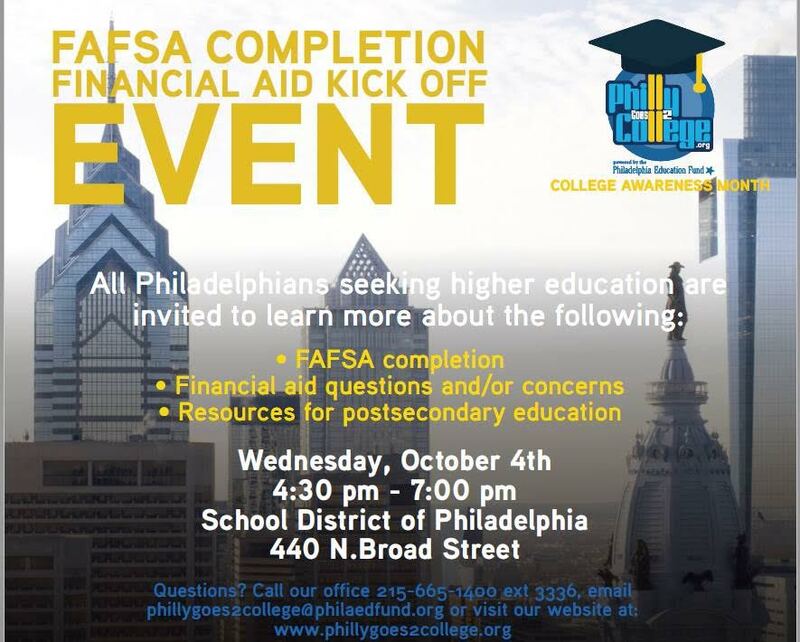 Dr. Hite also introduced this year’s FAFSA challenge, a strategic effort with the Office of Strategic Partnerships and College Readiness to increase FAFSA completion rates throughout high schools in the School District of Philadelphia. The WCMF $10,000 grant will help support this initiative by providing five monetary grants to the high schools that have increased FAFSA completion rates from last school year. The Wilt Chamberlain Memorial Fund also introduced its 2018 scholarship program, which opens up for applications on December 1. Eight area high school seniors will be awarded up to $20,000 for their college education. Also in the news, on October 31, the Wilt Chamberlain Memorial Fund with the help of Philadelphia 76ers employees, will host a College and Career Readiness Event at Wilt Chamberlain’s alma mater, Overbrook High School. At this event, there will be a panel discussion about the do’s and don’ts of applying to college, and four breakout sessions covering topics ranging from financial aid and planning to workforce development and career readiness.